I don’t know what it is about the Fender Telecaster Thinline Deluxe that it was so difficult to find one, especially with the specs that HARU has. The bog standard Thinline version of the Tele was introduced in 1968 (look up Roger Rossmeisl) as being a semi-hollowbody with a single (?token) f-hole. The Thinlines have been produced in several guises over the years and from what I’ve read, HARU’s was a Mexican-made Classic series version. 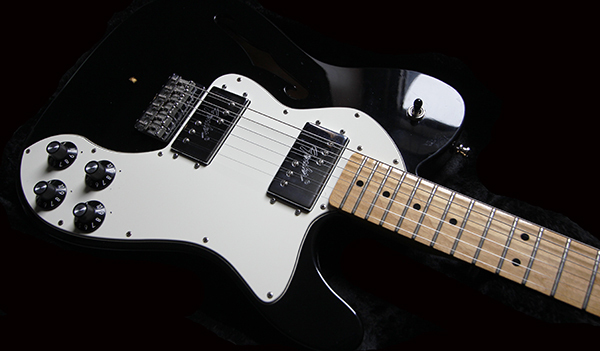 So, the only way to source one was the re-sale market using the keywords Telecaster, Thinline and Deluxe. For some reason, doing a worldwide search on eBay was a disappointment, but then there was this one seller who was selling one on the Yahoo! Japan Auction site. For some strange reason, the bidding stopped mid-way. And to add to the drama, the same seller (I’m sure it was) put it back up again. I bid again and the issue with the seller stopping the bid a couple of hours before the end time occurred. It wasn’t until many months later that I saw another one (although I had a nagging feeling it was the same guitar) and this time I was successful. The guitar then traveled from the seller in Miyagi-ken to Sheffield. I had to pay VAT for this unfortunately but it was so worth it. This was back in 2016. Now, if you listen to the tone, the Fender Wide Range Humbucker (FWRH) pickups sound like any regular humbuckers. The ethos of the FWRH when it was first built in the early 1970s (by the legendary Seth Lover) that it was to provide a fatter sound the typical single coil Fender tone but without losing clarity. These original FWRH pups stopped production in 1979 unfortunately but was revived in 1998 in the MiM Fender Teles which do not have the same tome as the original FWRH. The original ones can still be found in the re-sale market but are said to cost a bomb. 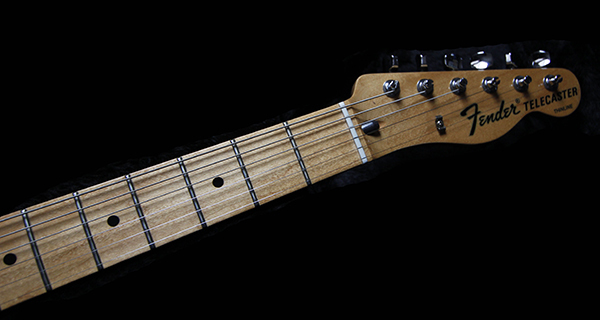 Her neck is one-piece maple with a comfortable C shape, with 21 frets. The headstock is of the Tele shape and looking at the serial number, she was made in 2011. If it wasn’t for the headstock shape, the hollow body and f-hole, she is no different than Miki-chan, my Tele Deluxe, especially when both share the same HH pickup configuration. However, the Thinline is ash, the original tonewood of choice for early Fenders. With the 2-volume/2-tone setup, any Gibson LP player will feel at home with her controls. No issues with the electronics on playing the guitar and I quite like her light hollow body. Just to add, I tend to obtain accessories relevant to the guitar that is acquired. HARU’s Fender monogrammed strap is of an older colour combo, and the only one I found in Y!JA was sold together with a Squier Tele. 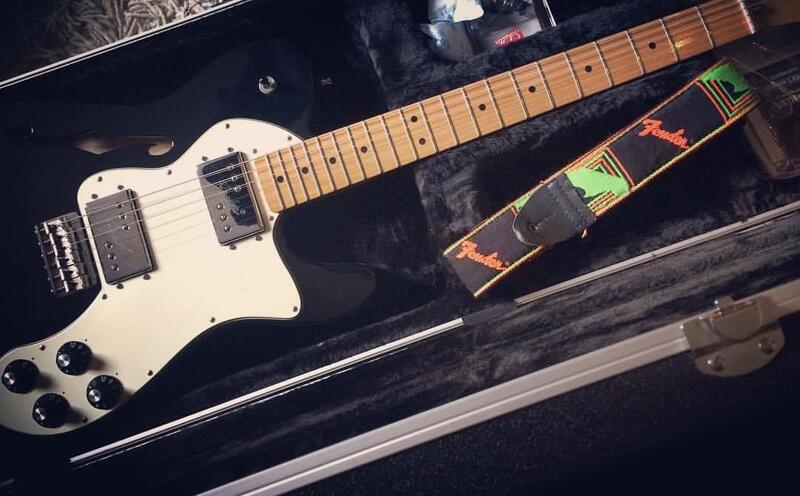 I wasn’t that desperate to buy a guitar just to get a strap. But my patience paid off when a year later, one was being auctioned off on Y!JA. On receipt, it had a leather back and did look old!